Montgomery County has had nine major tax hikes in the last sixteen fiscal years. The property tax was raised five times (Fiscal Years 2003, 2004, 2005, 2009 and 2017). In FY 2017, the property tax was raised by 9%. The energy tax was raised in FY 2004 and 2011. In FY 2011, the county’s leaders promised to sunset the energy tax hike in two years. That did not happen. The county raised the income tax to the maximum level allowed by state law in FY 2004. The county raised the recordation tax on home sales in FY 2017. Despite all of these tax hikes, the county’s revenue growth has slowed down. Between 1998 and 2009, county revenue growth (excluding state and federal aid) averaged 6.2% a year. 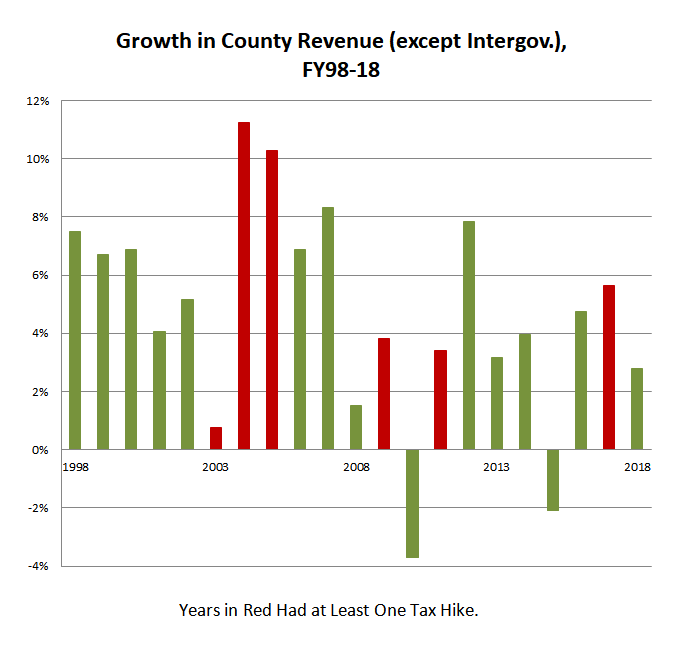 Between 2010 and 2018, county revenue growth averaged 3.1% a year. The county just reported a $120 million revenue shortfall despite raising property taxes by 9% two years ago. Raising taxes is supposed to be a last resort. In Montgomery County, it has often been a first and only resort. In the context of a stagnant jobs market and declining real per capital personal income, tax hikes are not generating enough money to finance strong budget growth. This is unsustainable over the long term.